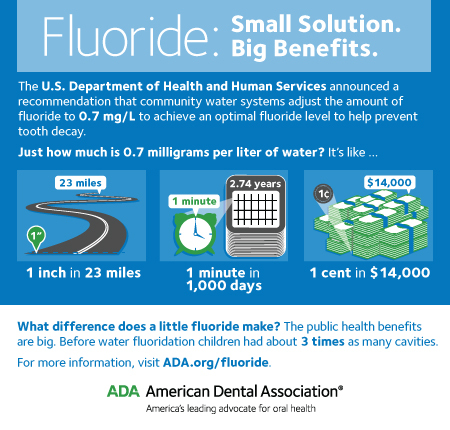 Adding fluoride to public water supplies is a safe and effective way to prevent tooth decay and has played a major role in in improving the public’s dental health for 70 years. “Fluoride’s effectiveness in preventing tooth decay extends throughout one’s life, resulting in fewer—and less severe̵—cavities,” says Surgeon General Vivek H. Murthy. Read on to learn more about what the Centers for Disease Control and Prevention (CDC) has proclaimed as one of 10 great public health achievements of the 20th century. Fluoridation of community water supplies is simply the adjustment of the existing, naturally occurring fluoride in drinking water to an optimal level for the prevention of tooth decay. Think of it this way: Water that has been fortified with fluoride is similar to fortifying milk with Vitamin D, table salt with iodine, and bread and cereals with folic acid. The number of communities who make the choice to fluoridate their water continues to grow. From 2000-2014, more than 449 U.S. communities in 42 states have voted to adopt or retain successful fluoridation programs. The latest data show that in 2012, 74.6% of the U.S. population on public water systems, or a total of 210.7 million people, had access to optimally fluoridated water.